Date: Dec 9 2018, 10 a.m. - 1 p.m.
Brunch with Santa on Sunday, Dec 16, is sold out! 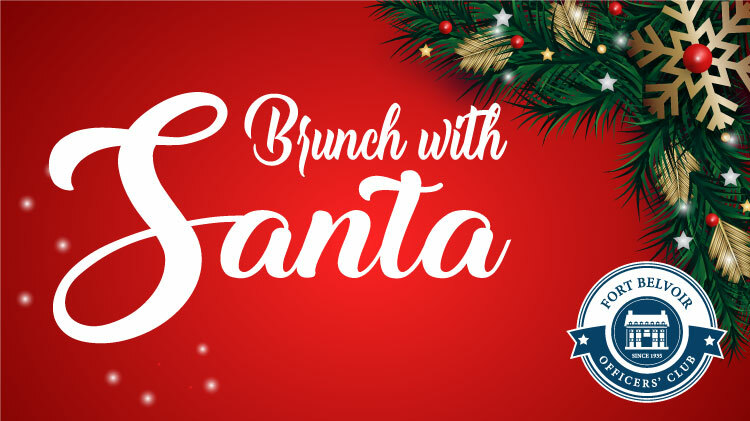 The Fort Belvoir Officers' Club invites you to a special Brunch with Santa! Don't miss your opportunity to meet Jolly Saint Nick this Holiday Season. Bring your camera and make magical memories. Santa will be available for pictures from 11:30 a.m. to 12:30 p.m. There are two dates for Brunch with Santa; Sunday, Dec 9, and Sunday, Dec 16. Don't forget your appetite and your cameras! Sunday Brunch includes a delicious waffle station, omelets, roast beef, unlimited champagne, mimosas and more! The dress code is business casual (no tennis shoes or jeans please). This event is open to all DoD ID card holders and their guests and installation visitors. Non ID Card holders must enter Tulley Gate Visitor Center. For more information, you may call the Visitor Center at +1 (703)806-4892 or visit the Gate Access Page. Children ages 6 - 12: $10.95. Reservations open Monday, Nov 26. Pre-paid reservations are required by calling +1 (703)780-0930 ext. 600, or by visiting the Officers' Club.